Westcoast : Can you be the F1rst Among Equals? 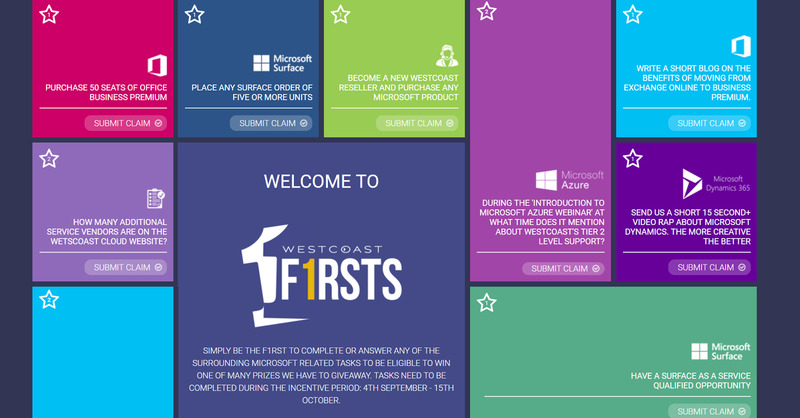 Whether you’re planning on purchasing 50+seat of Microsoft Office Business Premium, registering for the next Westcoast Nebula event, or signing up for a SimplySo trial period, it’s time to get your skates on. What’s the rush? An event is afoot. In being the first to complete any of the twelve challenges listed here, you will be entered into a prize draw to win one of nine spangly prizes, ranging from bungee jumping to a white wine pampering set. What’s more, the prizes don’t stop there. Once one has been claimed, something new will be will be added to the prize pot. Wh00t!! However, there is one caveat: you need to do all of this before October 15th. Simply complete one – or all, if you’re feeling ambitious – of the Microsoft-related tasks listed on the Westcoast F1rsts microsite at any point between now and October 15th 2017. We’re not omniscient, so next you’ll need to let us know which task you’ve completed, by clicking on the Submit Your Claim tab and filling out your details on the submission form. That done, it’s time to select your most coveted prize - £50 of lifestyle vouchers, FIFA ’18, Amazon Dot Echo, a Recon Observation drone, or whatever floats your particular seafaring vessel. Choose wisely though; the prizes are non-transferrable, so if you really rather fancied the teatime delights hamper, but selected the bungee jump in a fit of indecisive pique, the delight will be all your colleagues’ as they gleefully watch you fall through the air with nothing but a thin piece of rope between you and your maker. Next, all you need to do is sit and chew your fingernails while you wait to see if you are the F1rst. (Don’t worry, we won’t keep you hanging too long – you’ll hear from us within 48 hours). All winners will receive their prizes by November 1st 2017 and all losers can console themselves with the knowledge that someone else had to do the bungee jump. So what are you waiting for? On your marks, get set… F1RSTS!